At threethriftyguys.com we aren’t always about being thrifty, but we are also about being resourceful. 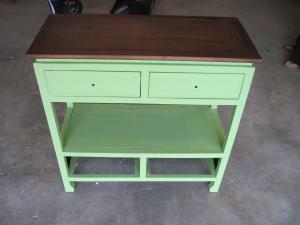 Here is a story of how my wife and I distressed a kitchen cart. Over this past fourth of July weekend my wife and I the opportunity of making a distressed kitchen cart. We found this cheap black kitchen cart at Gordmans, with a 20% off coupon, and decided to embark on our first distressing adventure. Here are the supplies we used, steps we took, and a few pictures along the way. Apply two coats of final paint color (using a roller on the final coat will help get a clear uniform application). Now time to have fun!! 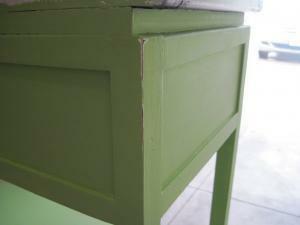 Get out the sandpaper and start sanding the edges and raised areas to give it a worn look. Go crazy. Typically the “uh-ohs” that happen are the best accents to your piece. 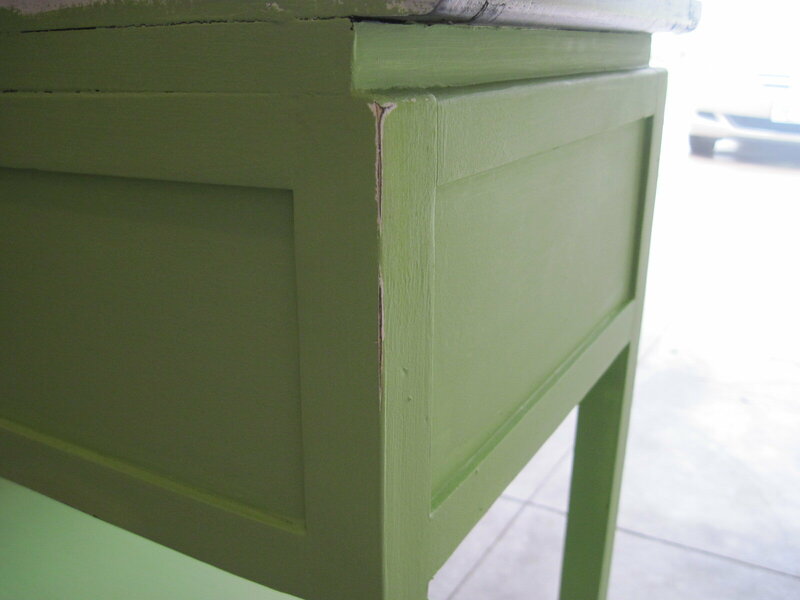 Use a knife to peel away paint at the edges to add to the worn look. I like scrapping the paint away at an angle to get as much black (original coat) and white (second coat) to show thru. Finally, apply the paste wax. Make sure you apply it lightly – kind of like you are waxing a car. Apply it to the wood in a circular pattern. 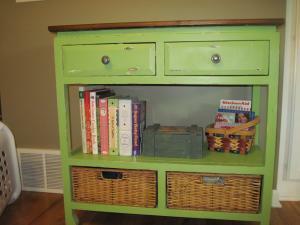 Here is a great how-to distress furniture video too. BeachBum offers some great tips that will definitely help. Even eight years later this distressed piece of furniture still looks great. At the time I had 1 & 2-year-old children and knew that our furniture would take a beating. By distressing the furniture, it has made it super easy to weather the abuse of my young kids! In the eight years of own this furniture, I haven’t once had to touch up the paint. In fact, the kids’ abuse has only added more “character” to the furniture. The only touch-ups I’ve had to do was repair the top left drawer. I had accidentally pulled it out drawer front plate and had to glue/nail it back together. 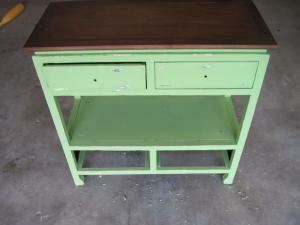 Overall, you won’t be disappointed with distressing your furniture and especially if you have younger children. One of the biggest keys is that you need to make sure that the furniture you are distressing is sturdy and can withstand the usage. All the additional abuse will only add more and more character over the years. You won’t be disappointed if you follow my tips and tricks to distressing your first piece of furniture.